Enable or disable lesson feedback. Add or remove your lesson from the Library. In the overview area You'll see information about the currently published lesson and also the draft lesson for the next version (if one is available). The published version is the version that your trainees will see when they are scheduled this lesson. If you hover your mouse over the current lesson box, buttons will appear with the options to preview your lesson or unpublished the lesson. 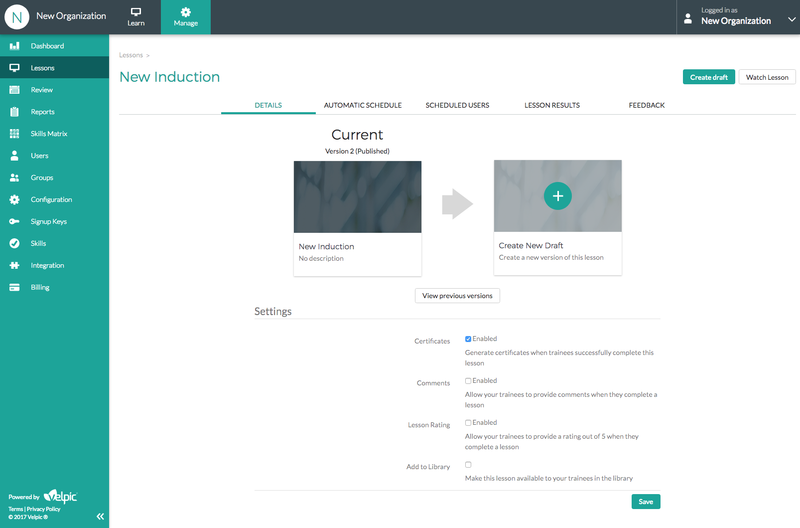 The settings area is where you can change how your trainees view this lesson, and enable/disable lesson specific items. When a lesson is successfully completed, you can enable / disable if a certificate should be generated and presented to the trainee. When a lesson is completed, you may like trainers to complete a feedback form on the quality of the lesson. The feedback received can be viewed in the Feedback tab. As well as lesson comments, you may like trainees to provide a "star rating" of the quality of the lesson. Enable this checkbox to add the lesson to your on demand library. By default, all users can see this lesson in their library. 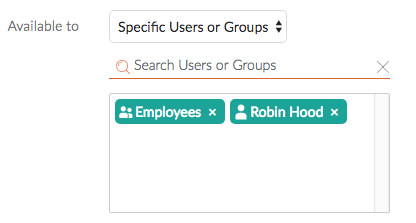 If you wish to restrict it to certain users or groups, you can do so by selecting the Specific Users or Groups option and searching for a particular user or group, as shown in the image below. 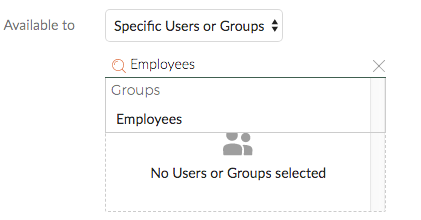 By selecting the "Employees" group here, you will restrict it to that group. Only members of the employees group will be able to see the lesson in their on demand library. You can add as many Groups and Users as you like. Each group or user selected will be able to see the lesson in their on demand library. Once you have finished altering your lesson settings, hit the save button to save your changes.